I've been running DD SL1's in a Lexus GX470 projector highbeam (9005 bulb) since June, larger and more intense (light meter tested) hot spot than standard halogens. VLEDS had a $30 off introductory offer on their new Micro Evolution line and free return shipping if the output, appearance,or quality was not up to standards or didn't fit, so I gave them a try. VLEDS looks/feel nicer/sturdier. Nicely finished all metal (including the bulb base and fan shroud) as opposed to the roughly cast metal and plastic on the SL1's. Took some effort installing the SL1's, to the point where the plastic pieces (only areas you can grip) came apart on one of the bulbs causing the cooling fan to fall out. DD did send me a prepaid label etc. and replaced it at no charge. When I removed the other original purchased bulb to swap with the VLEDs, I noticed the plastic on this one has begun to come loose. The O-ring may be too large as per evo77's suggestions but I believe the base might also be slightly over sized going by the abrasion marks. 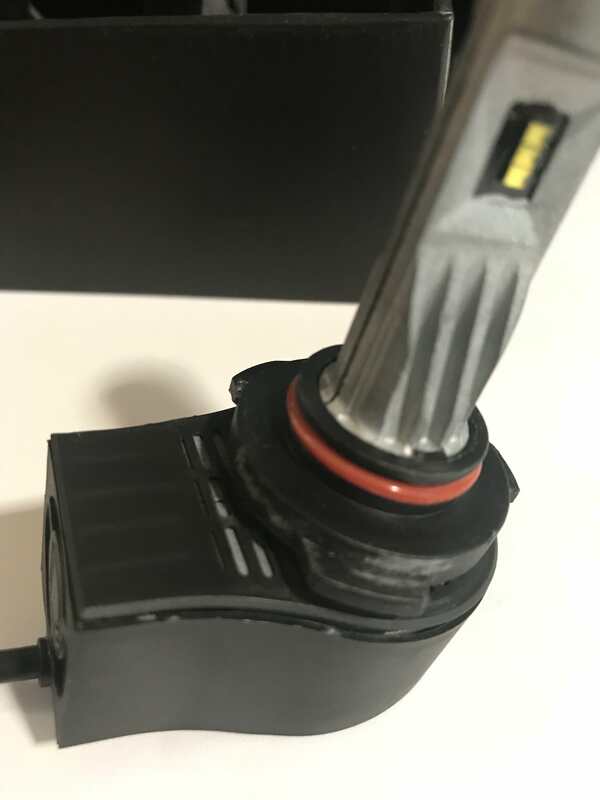 I also had issues with the connector, the locking tab slightly longer than halogen, requiring a quick trim so the OEM bulb connector can lock on. DD said trimming it won't void the warranty. Not too happy about this second bulb coming apart but I'm sure DD will replace it with no hassles. I'll be swapping O-rings from the halogens. Plastic coming apart and the scratch marks on the bulb base. VLEDS installed with no problem. Twisted into the headlight as easily as halogen. No trimming if the connector required. Both are audible, VLEDS is louder. Sorry guys, no beam pics. Highbeam pattern looks like a bixenon projector's. VLEDS has a slightly wider beam,but after using my light meter in two different occasions and locations, about 10ft from a garage door, then the next evening 20 to 50 feet (I moved closer to get better readings) from a brick wall at a nearby mall, the SL1 outperformed the VLEDS. Since it's a highbeam a more intense hot spot is better than a dimmer,wider beam pattern. DD SL1 performed better in my instance,but I'm a little disappointed by the flimsiness. The VLEDS may work better in a lowbeam projector due to the wider beam. I'll be returning the VLEDS bulbs. I wonder if TRS would offer a risk-free deal if I try the new 2-Strokes? but I'm a little disappointed by the flimsiness. SL1 are definitely not great in build quality. Flexy plastic and rough casting of the zinc. The VLEDs are really well made. Can't argue with Diode's output though! Yeah its weird Diode would've issues with the plastic portions of the bulb. After the year+ delay from their original release date... I was really expecting these to be THE go-to solution for great homogeneous LED bulbs. It left the field open for both Morimoto as well as the OEMS (Philips/Sylvania) to compete. Disagree, output wise they're still the king as far as I can tell. VLEDs Micro Evo are significantly less focused. 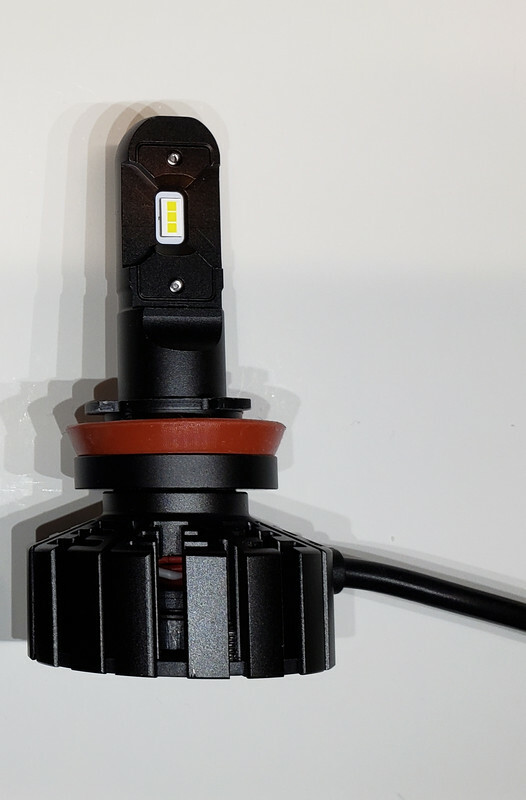 In the Prius/Camry/literallyeveryToyota H11 projector the SL1 excels with a strong focused hotspot and a slim strip of brightness along the cutoff while others hang lower and dimmer. The VLED ones I would figure would lose the down-range focus and spot. The distance between PCBs is the largest. The BT G11F has a slightly better beam focus than the SL1 and is also brighter. Mainly because it's 28W versus 20W. I have not had a chance to test those unfortunately. Took the VLEDS bulb out just now to ship them back, no scratches on the bulb base indicating an interference issue. Also something else I forgot to mention in my original post. I noticed the SL1 I took out would not turn on during bench testing yesterday; swapped to the VLEDS and it powered up, swapped to 9006 LED (basically a LED turn signal bulb with a 9006 base) and it too powered up. Turns out the polarity of this bulb's connector is reverse although + and - symbols are molded on to the connector. 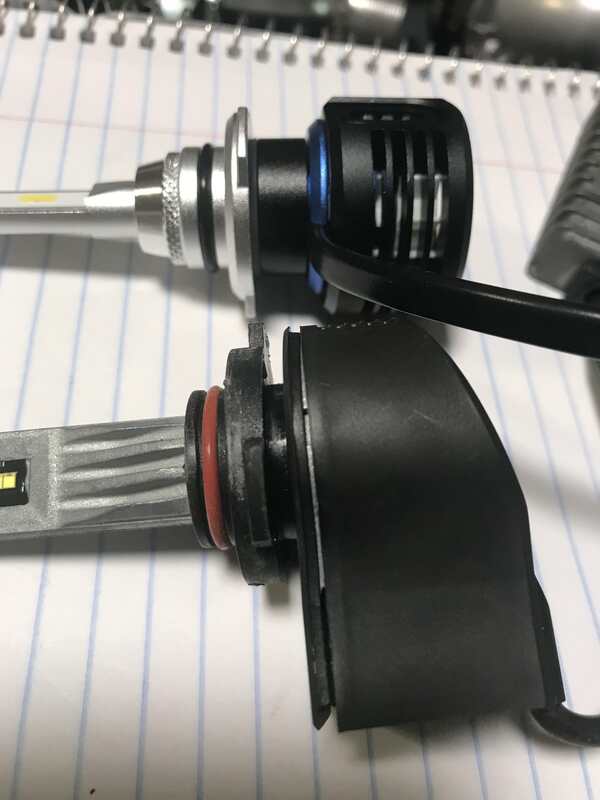 I'm not the only one with a reversed polarity connector, but in DD's defense they did address and resolve the issue. https://www.supraforums.com/forum/sh...ing-soon/page9 posts #86, 93, and 97. Again, really weird. I've got no problem supporting quality workmanship and manufacturing and the whole 'made-in-america' montra. But it is bothersome that there were these strange QC issues with the SL1's. I haven't heard of anyone having problems with the fully cast SLF's though (and the premise of a true PC Yellow model is a good feature for those looking for it as well). The VLEDs Micro Evo is just a rebadged bulb with a different color and a slightly different heatsink base. This bulb is made by the same company as the Morimoto. The 2stroke 2.0 however has a more Morimoto influenced design outershell and different choice of LED chips (Luxeon Z ES). There are a few problems with the VLEDS that makes this bulb nothing more than mediocre at best. 1) Focus. The distance between both sides of chips is 4mm. Add in the height of the Seoul Y19 chips and you've got 4.81mm *roughly*. That is too thick. The farther spread apart the chips on both sides are the less focused of hot spot there is. The allowed thickness may vary depending on the brand chips being used (some are shorter/taller than others) but in the end the overall thickness from chip to chip must not exceed 3.3mm-3.5mm *roughly*. The SL1 is about 3mm. The BT G11F is about 3.3mm. 2) Focus again. The distance from the collar to the bottom of the last chip die must be at a precise height. Most manufacturers are mimicking the distance of the halogen filament but that is wrong! I have verified and documented that the distance on the H11/9/8 applications must be pushed up 1mm higher for optimal beam performance. For the 9005/9006 I suspect is the same however I cannot fully confirm at this time as I only have a few 9005 lamps and need a few more for testing. 3) Power. In order to make a significant impact in illumination over halogen, you need a healthy dose of power. The SL1 puts out about 20W and with its beam focus (although can be improved) is able to generate a decent boost in light output. Anything less in power is not worthy of a being called an upgrade to halogen. But even if you have bulb with 20-21W, like the VLEDS Micro, if the focus is off there is no improvement. The BT G11F has focus and power which makes it the #1 bulb that I have tested for performance. 4) Thermal design - Hot Lumen. Most LED bulb designs have a poor thermal system. Although the designs are continually getting better most of them exhibit what is referred to as hot lumen. Once the bulb is turned on the LED chips rise in temperature and the light flux starts dropping fast. This is why taking measurements immediately after turning them on is a bad practice because the bulb is still warming up and losing output. 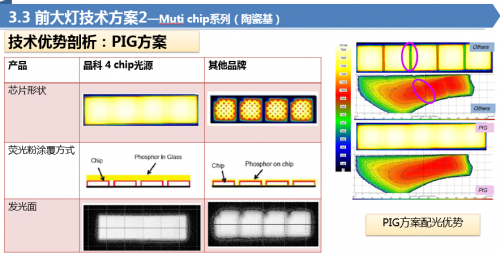 The heatsink is incapable of drawing enough heat away to keep the LED chips stable and operating at their optimum performance level. What this means is lower than advertised output levels and a guaranteed short life span. I've tested bulbs that lose 30-40% of light output within a 60 minute period! That is ridiculous. The SL1 has the BEST thermal design on the market, hands down (no shocker there). There is a reason why it has what some of you consider an ugly rough cast finish. Its because it plain works! The zinc casting and fins all do what their designed to do and that's extract heat away from the LED chips. How good is it? I tested a 7% light decay rate after 60 minutes. From the point of being powered on (5 seconds in) until 60 minutes later. With the SL1 you essentially have full light output from the moment you turn them on until the end of your end of your destination. For the VLEDS Micro, it too has a decent light decay rate at 9% after 60 minutes. The copper heat pipe is doing a good job. The BT G11F has a much larger light decay drop at 18%. Despite this drop it still remains one of the best of the bunch for brightness. With all this being said, it is important to understand that despite a LED bulb having all the key ingredients shown above it does not always guarantee good beam performance. Some lamps, reflector and projector, just do not take kindly to anything other than a halogen bulb. Due to their complex reflector designs a metal body that is not transparent, such as that of a glass halogen bulb, will disrupt the beam and cast heavy shadows no matter which way the bulb is clocked. I have tested some that do increase the hotspot but reduce light flux in other areas of the beam. And because of this, it cannot be considered an upgrade. Not because it is a bad bulb. Because it just isn't compatible with the lamp. One other note I forgot to mention about the VLEDS is the chip gap. If you look at the images I posted, you will see noticeable gaps between each 3 chips. That is horrible for focus. Those guys need to be butted up right next to each other. Diode Dynamics does just that with their SL1 so that there are no gaps. 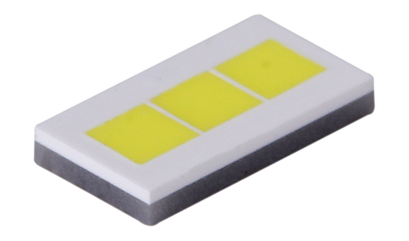 The complexity with placing these chips so close to each other and the thermal issues that come along with that is the reason that many LED bulb manufacturers are starting to use automotive grade 1-piece LED chips. Not only are they are more resistant to higher temperatures but all the dies are placed much closer to each other with gaps as small as 0.1mm. This eliminates any streaky patches in the beam and poor focus. Just to re-iterate what's been said here: I have HB3/9005 SL1, the fan casing split while I was installing it on my car (MY10 Legacy), very flimsy. Also the moulding is slightly oversized so it's hard to install. The plug I had to flip/install the wrong way as the wiring was wrong. But it went onto my brother's MY15 WRX without issue, plugs in correctly. Hmm... FWIW, I know some vehicles have their OEM polarity reversed as well. It was a common known issue with Toyota Matrix's back in the day running HID kits, that people had to plug in the ballasts with the harness backwards. Otherwise they would not fire up. But when one bulb is (-/+) and the other is (+/-) that's just weird. If anything LED bulbs should be made polarity independent to maximize compatibility.